Breakfast. My favorite meal of the day and honestly, I could eat breakfast-y foods all day long – there’s a sense of comfort that comes along with them. For the last few weeks, I’ve been obsessed with these breakfast potatoes – they’re savory, full of flavor, and satisfying. They’re also super versatile! I’m sharing a basic version below, but if you’re not following an AIP diet, the options are literally endless! I’ll provide some ways to change them up in the notes below. These are delicious on their own or stuffed into a tortilla (or Paleo Wrap)! Optional add-ins or toppings: avocado, chives, guacamole, salsa, hot sauce, mushrooms, jalapeños , vegan sour cream, cheeze sauce, ketchup. *NOTES* I used white sweet potato for this recipe, but really any variety of potato will do. If you are following a strict AIP diet, you will have to stick with sweet potatoes or yams. Instead of coconut oil you can use vegetable or mushroom broth – it will add a different flavor and the onions + potatoes may not crisp or brown as nicely. You can use kale or arugula instead of spinach or do a combo of all three. Other flavor ideas: Garlic + sage, curry, chipotle, salt + black pepper, Italian seasoning. Wash and cube the sweet potato – I leave the peel on. Place into a pot of water and boil for 5-7 minutes to soften/pre-cook them a bit. Make sure to not overcook them as they will become mushy. Drain and set aside. While your potatoes are cooking, thinly slice your onion. Over medium heat, warm up a large pan with 1-2 teaspoons of coconut oil (or broth). Depending on the type of pan you use, you might need more or less oil. Add the onions to the pan and sauté until golden and slightly crispy. Once the onions are done and potatoes are boiled, add the potatoes to the pan of onions and sauté until they begin to brown. I’ve learned to not be an over-stirrer! It’s OK to walk away from the pan for a few minutes. If the potatoes are sticking to the pan, add more oil or broth. I used a ceramic pan for this recipe and used a very small amount of oil. Once the potatoes are evenly browned, stir in the seasonings and cook for another 2-3 minutes. Next add in the spinach and sauté for another 2-3 minutes, stirring frequently. 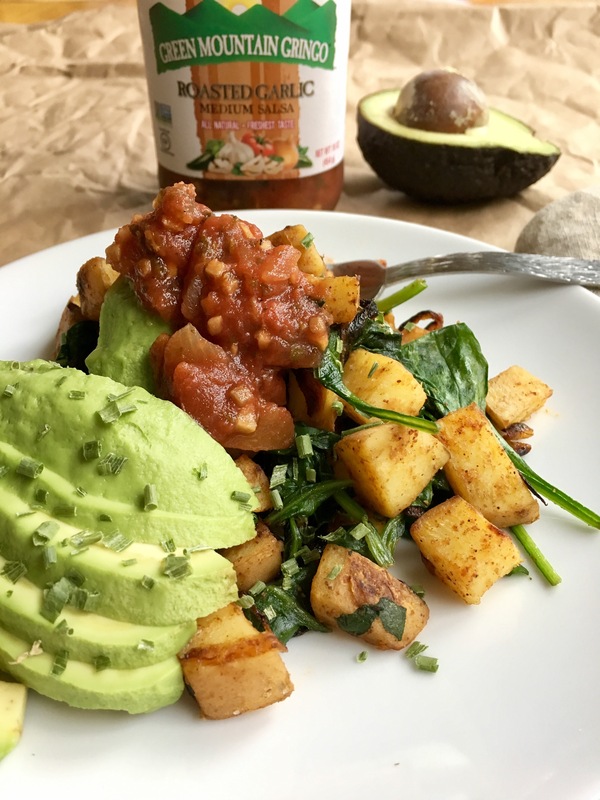 Salsa goes really well with these potatoes and one of our favorite store-bought salsas is Green Mountain Gringo! It tastes super fresh and doesn’t contain citric acid or any weird ingredients. We love the Roasted Garlic option. I’d love to hear if you give these breakfast potatoes a try! Oh, wow! We’re totally on the same wavelength. I took pictures of a breakfast potatoes recipe that I’m sharing on Monday. It looks like we’re all needing some comfort food! Yours look delicious! Yes please! Breakfast all day every day (and potatoes!) Btw, Green Mountain Gringo salsa is THE BEST jarred salsa I’ve ever had ❤ A pantry staple! Since I actually eat savory breakfasts most of the time these days, these sound and look so very enticing! Paprika is my favorite spice on potatoes (and other things) and with a bit of cheesy nutritional yeast…mmmm ❤ Plus a good way to get in lots of greens sans smoothie! I could eat breakfast foods for all meals too (and do! ), and these I could certainly see as breakfast, lunch, or dinner 🙂 Gah they look so toasty and golden I keep scrolling back up haha! So yummy! Love breakfast potatoes! I totally could go for a giant bowl piled with veggies and toppings! Yum! Mandy, remember me telling you I’m on a savory breakfast kick and no longer want sweet stuff for breakfast?? Yup, these right here just made me salivate big time. I’ve been eating everything from curry to breakfast potatoes or my mexican potato burritos to bean or avocado toast. It’s like I’ve reached a point of wanting only sweet for dessert or an apple for snack, but not to start my day. I feel healthier as well. These look so delicious and I love that you used sweet potatoes. They are my favorite and I eat so many of them. I definitely need to try your version. I have a bell pepper, onion and potato breakfast mash I’ve been making for years but I’ve never tried it with sweet potatoes, that is an amazing idea! Such a great and simple recipe!! Love that you paired it with greens too, the pics are just beautiful!! Yes!!!!! Haha!! Well, mission accomplished! I totally thought of you this week because I reintroduced curry (spices) back into my diet and so far, no reaction! So guess what I’ve added into breakfast selection??? Curry!!!! And I couldn’t be happier! Totally warms you up and is the best comfort food. Since I’m not doing beans yet, I pair it with squash and potatoes…I must revisit your curry recipe! Same here!!! I used to start my day with loads of fruit or maple syrup drenched pancakes…my tummy feels loads better now that I do strictly savory and I no longer crash hard in the afternoon.